When there is an eCommerce, there are emails. Email marketing has grown so much so far that it has become much more important for a fashion eCommerce store than any other traditional or digital marketing techniques. Though you are here to improve your conversion ratios, it directly affects all of your goals mentioned in the above list. Hence, let’s straightaway discuss how you can improve your fashion eCommerce emails and see an improved conversion rate. Looking at the above email marketing statistics, if you plan and strategize it effectively, you can take the benefit of increasing the traffic as well as conversion rates. The hacks to improving your fashion eCommerce emails begin with how you plan your complete email marketing. How many emails do you want to send to your customers? What kind of emails do you want to send to your customers? How frequently would you send them the emails for each campaign? How would you design each of your emails? How would you design your email templates? Based on all the above decisions, create a documented strategy including all the above. The plan remains just a plan if it is not documented. Once, you are done with planning and documenting your fashion eCommerce store, you now need to focus on how you would attract, engage, and delight your customers through your emails. Among all the other, the most eye-catching thing in your email is the SUBJECT LINE. The subject line of your email decides whether the customers should open your emails or not. An average email open rate is 41% for shopping industry out of the data of 312,000 emails. Personally, I prefer to read the emails that include my name in the subject line. And, I seriously don’t even bother to open the emails with the following kind of subject lines. If your email subject line fails to impress, your customers won’t engage. Well, not all fashion eCommerce brands do this mistake. But, this happens to the online fashion brands that are completely new to eCommerce and even with the email marketing thing. Also, this happens to people who have limited email addresses to set up their email campaigns. So, to avoid buying an email automation tool, they send an email with their own email address in the “To” section and all the other ones in the “bcc” section. Learn this now and keep it with you forever for your email marketing success. Here, I share a sample of how people use “bcc” in their email campaigns. And, I was the victim of this campaign. You know what? Most of these kinds of emails are considered as spam and are often missed by your customers. So, always avoid having “bcc” in your promotional fashion eCommerce emails. They won’t drive you any business. Another eCommerce email marketing hack is to have a personalized email address. Okay, before I move on to show you the type of email addresses you should have, let’s go in reverse here. Please, please, please! Please never ever use “noreply@yourbusiness.com” kind of email addresses. Now, that you know that you should never use such email addresses, I would suggest you brainstorm on the names that you would use to give a personal touch to the email addresses. So, what should you do and don’t to choose the right email address to improve your eCommerce email experience? Here, I haven’t known any fashion eCommerce brands doing such things. But, I have an example which I strongly recommend people should do. Like, if I were an owner of an online fashion store, I would have an email address that gives people a feel to be connected directly to me, rather to anyone random from the brand. This is definitely not a fashion eCommerce store. But, if these kind of emails are unable to do good for these brands, then how would they help your brand? Email addresses decide how smart and genuine you are, whether it’s personal or professional. The most preferred mode of communication is the email these days. OMG! Hats off to smartrmail.com to bring such a huge newsletter which even I was tired of looking at it. If the email marketers cannot enjoy such a huge email, how can you expect your customers who have too less patience, to read the entire email? The eCommerce emails tend to have less text and more of images to attract your customers. Hence, you need to be extra careful while crafting your promotional emails. So, here I come up with another email marketing hack for your fashion eCommerce store is to keep your emails short and simple. Customers have the lowest patience level. Keep your emails short, relevant, and conversion-focused. So, if email personalization has such great after effects, you must do it for your fashion eCommerce store. Personalization is necessary. But, when and how, makes a huge difference. Recently, Google rolled out an update named mobile-first index. Also, the entire eCommerce industry is shifting their focus towards mobile because as per Statista, almost 40% of retail eCommerce is expected to take place via mobile in 2018 and 54% by the year 2021. And, does the conversion ratio of your desktop emails are more compared to the mobile emails? This means, your fashion eCommerce emails look great on desktops compared to mobile. Why do you use promo codes for your fashion eCommerce store? Obviously, to boost the conversion ratios and ultimately, sales. But, promo codes decreases the cost at which you are selling your products. So, I have seen various brands not focusing on sharing promo codes that are easily visible. But, as you do on your website banners, you also need to highlight the promo codes even on your emails. Promo codes invoke the conversion ratios. Use it strategically to work for your own benefit. If customers are given freedom to opt for subscribing to your newsletters, then they have all the rights to opt out. And, this is important for almost all the companies focusing on email marketing. In fact, fashion eCommerce brands never fail to entice their customers through emails. But, sometimes, the users are no longer your follower or maybe he/she is frustrated by your emails or anything else. Rather having the subscribers unnecessarily, who are hardly going to get converted, you should only focus on the people who are actually going to buy from your store- your genuine brand lovers, customers, and followers. But, it is even more important to plan the ‘unsubscribe’ process effectively. This is the footer of H&M where they have placed a link to unsubscribe and I really liked the way they’ve placed it. The link’s font color is darker compared to other information present in the footer. 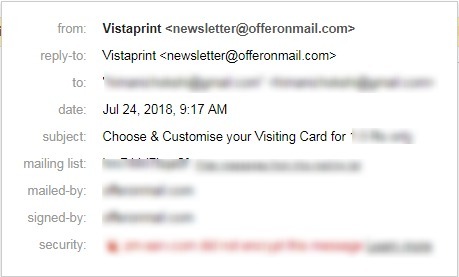 So, it is easy for a user to find the link to unsubscribe. Unsubscription to emails is not about your wish. It is about the customer’s choice. Email marketing for fashion eCommerce receives almost 100-1000% or more conversion ratios if done rightly. Don’t email your customers just for the sake of marketing, do it in a way that increases your count of loyal customers and improves your overall ROI. What is that one email marketing hack that made a spike in your Google Analytics? Share it with us.